I didn't get any sewing done after all this weekend (I'm going to have to make a public goal of finishing Princess' curtains this week - so that I actually do it!) - but I did get a little thrifting in. 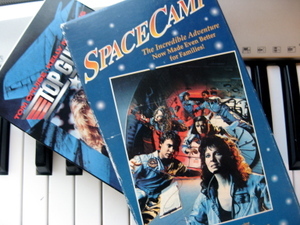 Spacecamp! Does anyone else remember this movie? It's so great in a bad '80's movie kind of way - but in a good way, too. I totally remember watching this movie on TV (Disney channel?) with my sibs. It's as good as I remembered and a big hit with the boys because of the space shuttle (and it has an all-star cast!). Oh, and today I found 'I am Legend' - but that's not for me. Aaron wanted it. 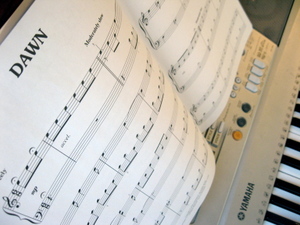 This is a little nerdy, but it's been fun playing with Princess' piano books. I took lessons for a few years (if that) and my last lesson was when I was about eleven. So, it's not surprising that Princess is passing me up already. 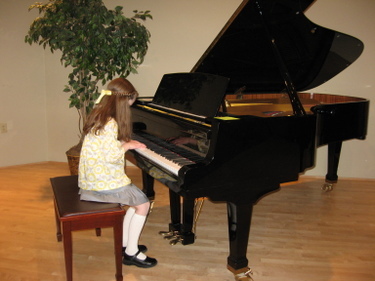 Her recital was in the recital hall of a local music store - and since she needed new books, I was looking around and was excited to find the Pride & Prejudice score in an 'Easy Piano Solo' version. Woohoo! My sister has the 'real' one and it's HARD. Not that the easy one is that easy... for me, anyway! So, I've been tinkering around - and I will master this song if it kills me. Besides, it makes me happy just that I can even attempt this music. So beautiful. 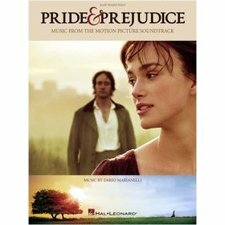 When Princess and I came back from our girls' night out this weekend, I found that Aaron had bought the soundtrack from Amazon and downloaded it for me. Because somehow I didn't have that one yet. Because that's the kind of husband he is. We need more clipboards - he stole this from Princess and has claimed it as his own. 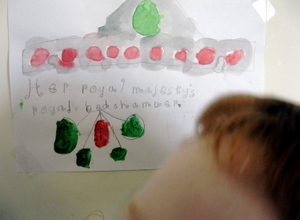 It's no wonder, really, why she keeps coming up with new 'control panel' type signs for her room. I couldn't even keep the boys out of the photo! Have a great weekend! We have a local ballet performance to attend (a semi-annual mother daughter date for us), and I'm hoping to get some thrifting and sewing in, too! 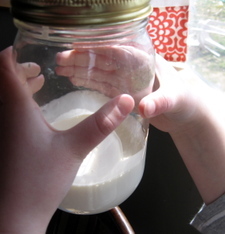 Some more 'Colonial' type activities for history: making butter. 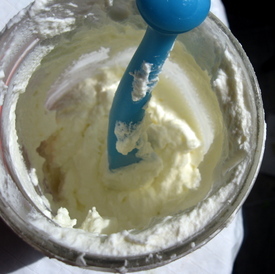 (It seemed to take a while to get past the whipped cream stage - and it's still really soft - but lovely on toast). 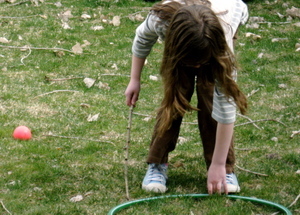 Yesterday Princess decided to try rolling a hoop with a stick. Thomas is scheduled to start Kindergarten this summer. For those who don't know, he is currently in a full-day preschool at a school for children with Autism. 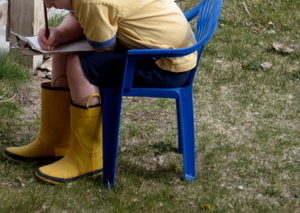 He was the only child in his class whose parents didn't apply for the kindergarten there. We don't know what to do about kindergarten, quite frankly. I thought that school would be the best situation for him as long as he was happy and had a good setup. They have routines - he loves routines and it's hard to have strict routines at home - stuff WILL come up (case in point: 2008 so far). I feel a little bad about sending him to school when we don't send Princess and aren't planning on sending Monkey. But as I've said, that is a choice we make individually for each of our children. I thought that I'd like to keep Thomas home at some point - maybe after he's had a few years of schooling under his belt, hopefully at that point his attention span would be a little better, and he'd know how to read (I'm not scared of teaching him to read - he's starting to - he just doesn't like to sit and work on it with me at home). I feel entirely different about that now. 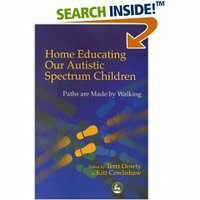 I stumbled upon this book called Home Educating Our Autistic Spectrum Children on Amazon, and luckily, my library had it. It was quite good. Surprisingly helpful. Set up as the stories of 15 or so families and their experiences and why they started homeschooling their Autistic spectrum (nearly all were Asperger's) children. What was really helpful was that their children were older than mine, and most of them were pulled out of school at some point. You could see the problems the kids had had in school - and so many of them had similar problems - some of which we've already seen with Thomas/his school this year. It really flipped my viewpoint completely. (Side note - one of the homeschooling books that really helped us decide to do it was set up in a similar way - just lots of families stories. All different, none that I related or agreed with completely, no preaching - but very helpful all the same - and I can't remember the title...). This book made me re-evaluate our decision to keep Thomas in school. 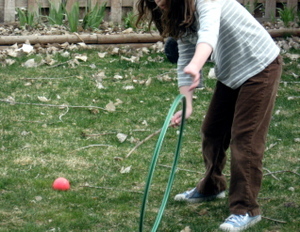 All of the kids in the book learned so much better without all the classroom distractions and more one-on-one attention. Also, in our area they teach reading using the whole-language (sight reading) method, which I strongly disagree with (Phonics! 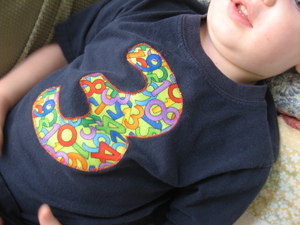 Phonics!). Thomas is getting both. At home we work on phonics, but at school they are using the Edmark program, which is sight reading. So why do I want him to learn reading at school? I don't! Like many of the children in the book (and many children with no delays or diagnoses, actually), many days Thomas has meltdowns after school. He works hard at his behavior and ignoring the overstimulation at school which just takes up all his energy, and when he's home he lets go. This happens nearly every Sunday as well - his behavior at church is getting better and better - but when he gets home he's done. Usually when he's home for a long-weekend or has a school break he's a happier kid overall. Not so many meltdowns. And now I have no idea what to do. More and more, as positive as the counselor made the situation seem, I'm thinking that it might not work out. He'd be in a large room divided into two classrooms - each with at least 25 kids. There is one kindergarten aide who divides her time between three classrooms (but supposedly they have a lot of parent volunteers). Right now Thomas is used to a classroom with 10 children and 5 teachers. Yeah. He seems to go in cycles - I've mentioned this before - but up and down and up and down. Sometimes we realize what triggers an 'off' time, but usually not. He's going to have 'off' times in Kindergarten - can they handle that? He's a great kid. He's smart and capable, but he requires a little more direction most of the time. I've also realized that my expectations for my child in school are simply too high. I didn't think that they were, but this year has been an eye-opener. I want him to be happy and challenged. That's it. But he's not getting it at his school now, and I can't imagine that he'll get what he needs at this public school. There is some major thinking (and praying) that needs to be done here. I have to admit that it's nice to have some quieter time to spend with the other children when Thomas is at school. I have to admit that I don't know exactly how it's all going to work if he stays home. But I also have to admit that my heart is just not into sending my boy to school - again - he's been in some kind of early-intervention or preschool class since he was 2. 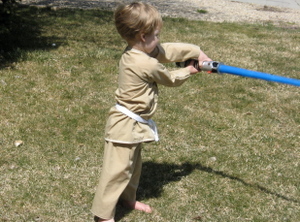 My handmade gift for Monkey's birthday was this Jedi costume. I made it from super cheap fabric (I think the whole thing cost $5, including the bias tape). I made up the pattern - thank goodness it worked - and fit! It only took about an hour to make. I didn't have enough material left for a belt - so I used some white webbing left over from their pilot costumes - which the boys took joy in fraying, so I'll have to replace it. Outfit - check. 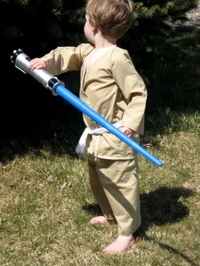 Lightsaber - check. Shaggy blonde hair - check! 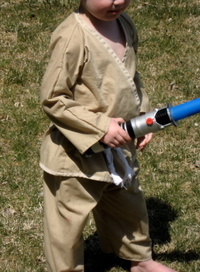 It's official, he looks like Luke Skywalker. Monkey loves the costume. 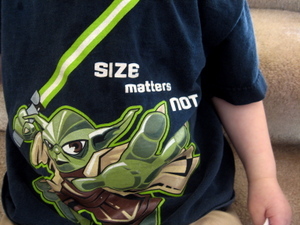 He HAS to wear it when we watch one of the movies (it works equally well for Luke Skywalker, Anakin, or Obi-Wan-Kenobi-when-he-gets-younger) or when he's listening to the Star Wars soundtrack he got for his birthday (Thanks, Nana! 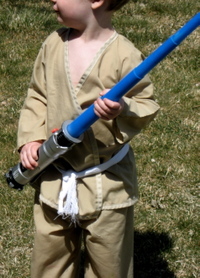 - We also got him a couple of these freaky Star Wars toys that he really really wanted - he LOVES them). He had a good day. 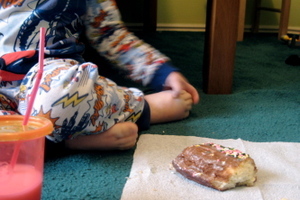 Donut Picnic in his room. Just the two of us. It may be a new tradition. 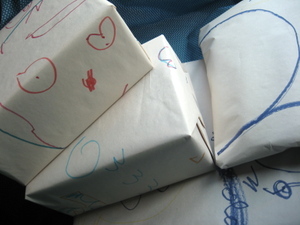 I love having the kids make wrapping paper. Thomas made the cool face - it had 5 ears. Monkey was an excellent helper decorating the cupcakes. 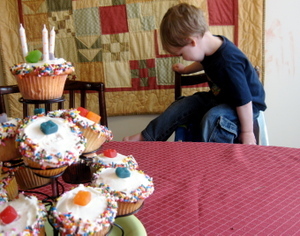 Thomas had come up with the idea that Monkey should have a LEGO cake - so we made cupcakes (I so love birthday cupcakes now - and way easy to sneak a few gluten-free ones in there) with LEGO fruit snacks on top. 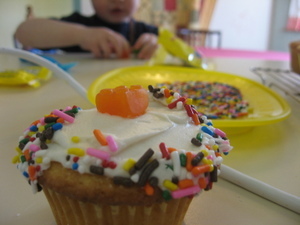 Monkey built towers with them, while I played with sprinkles. 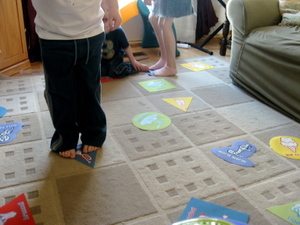 A game (or two or five) of Hullaballoo helped pass the time until the grandparents arrived for a yummy dinner. And all that mattered: He had a great day. Today Monkey is three. I can hardly believe how fast the time has gone! He is such a cool, funny kid. He's now three going on 13. 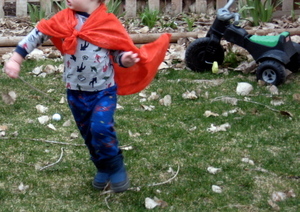 He's my prince - jedi knight - super jumper - comedian - monkey. He is so funny and I'm so glad I'm his mom! I like to make the birthday really revolve around the birthday kiddo. 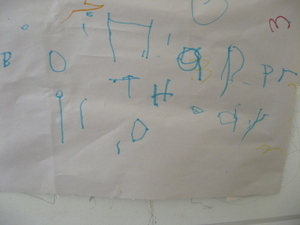 I came up with a list of things that Monkey likes to do - and that was our agenda for today. No errands, just fun. Until Thomas woke up in the middle of the night with croup. Now he's home from school, which is fine - but throws off all our plans! Breakfast: Donuts - still on, but complicated. We usually keep Thomas' gluten-free donuts in the freezer, but the store has been out of them recently, so so are we. We were going to eat them after he went to school - so now we'll have to sneak them? I feel bad about that, but Monkey picked out his donuts at the store yesterday - so we already have them. Playdate with friends at the park canceled due to weather (it snowed yesterday! Eighty degrees Monday, snow Tuesday...) and now I can't ask the little boys over to our house either. Out for Lunch Thomas' diet doesn't allow for going out to lunch - I'll have to make Monkey a corndog. Feed the ducks on the way home from the bus stop Now we're not going to the bus stop - plus the weather and Thomas being sick. Dinner, cake, and presents with the grandparents Hopefully still on. Monkey insisted on hot dogs for dinner - so we'll grill and I'm making yummy baked beans. Okay, so now I need to think of some Monkey-centric home-based activities for today! I let him open two gifts (his new 3 shirt and new Charlie and Lola books) this morning - I'm going to be tempted to let him open everything early just to make the day special - I'll try not to, though. 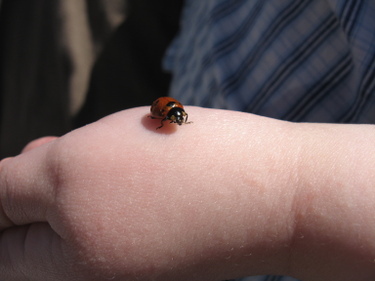 Anyway, happy birthday to my little guy - I hope you still have a good day! Amber tagged me for a very fun/challenging meme. The idea is to come up with a memoir for yourself using just six words (and accompanying photo). Amber chose six beautiful and poignant words. 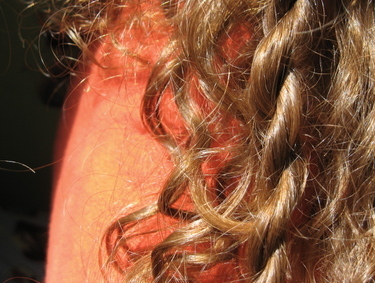 Sometimes my hair looks like rope. 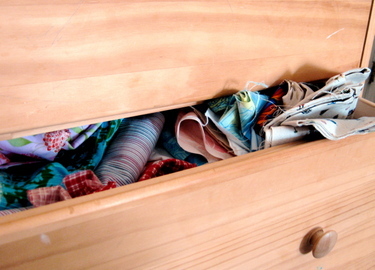 I have entirely too much fabric. 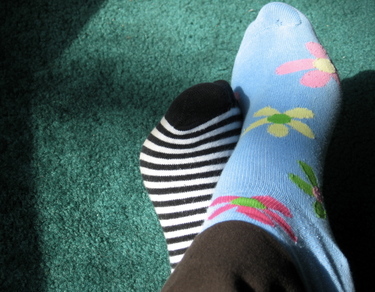 I like socks loud and unmatched. I hate tagging people because I never know who'll actually want to do the meme, so play along if you'd like - this one was fun to think about.